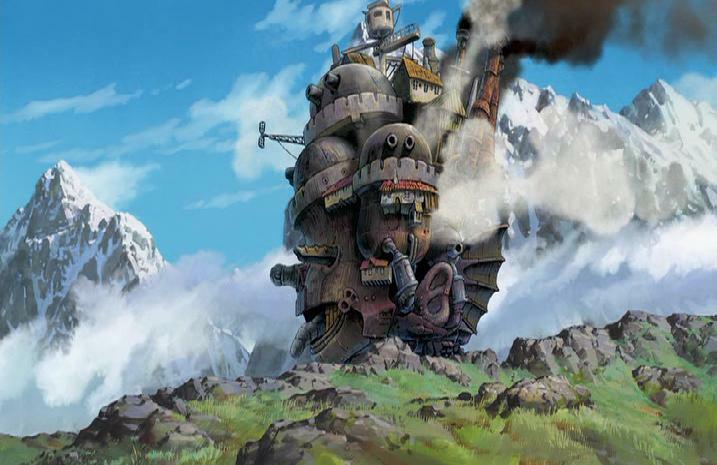 This website is dedicated to all things Howl's Moving Castle - the book series and the film. Hello, welcome to Shooting Stars (Also known as Stars Orchid and Sophie's World.) This is the fansite dedicated to what is argubly Diana Wynne Jones's most popular and amusing book. This website has been up since 2004. The guestbook has been kept since 2005. Your currently at the Shooting Stars home page from where you can visit all the infomation you want about Howl's Moving Castle, and now its sequels. Character bios for both movie and book, story outlines, quotes, pictures and events going on in the world. Visit Market Chipping to have a look for Howl's Moving Castle merchandise. There is stuff from books, to soundtracks, to even the first DVD releases of the movie itself. I am applying for university this year so response to emails, questions or updates to this website will be short. But I am still here! Please add your name to the guestbook when you leave! This site has had 1330 hits this month. Changed the layout slightly and gradually making updates here and there. I have completed my examinations so I'll have a little more time. Also made minor changes to the FAQ page. Work has begun on the book section and minor updates to the FAQ page on Howl's Moving Castle's allusions to other works. I would also like to thank all that have visited the website as we have reached 5000 visits the beginning of this month! I am also removing the fanfic page by Christmas because no one ever bothers to send them, so I see no reason why the page should be there. I'm not doing this to be nasty - I'm doing it to save space. I have updated the FAQ in response to a vistor of the site. Thank you to them for visting and asking the question by the way. I am also getting to work on the Castle in the Air and House of Many Ways page. With the holidays here I'll have time to re-read the books and update the pages. Hello everyone. I'm still here. 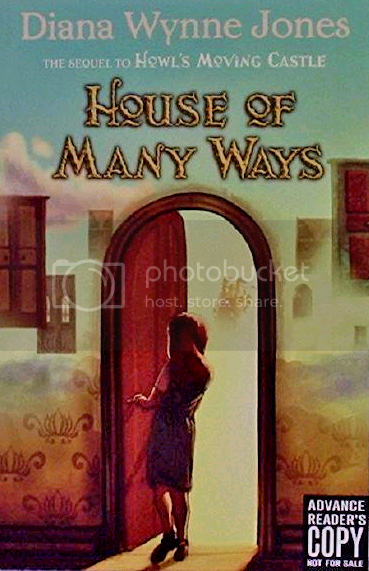 Well I finally got my pre-ordered copy of House of Many Ways. On first impression I can safely say that the British cover is beautiful in hardback. I have already had a flick through and I intend to read it this weekend before really getting to work on its own page. I am working on the Castle in the Air page again and beginning work on the House of Many Ways page. A chaotically magical sequel to Howl's Moving Castle. Charmain Baker is in over her head. Looking after Great Uncle William's tiny cottage while he's ill should have been easy, but Great Uncle William is better known as the Royal Wizard Norland and his house bends space and time. Its single door leads to any number of places - the bedrooms, the kitchen, the caves under the mountains, the past, to name but a few. By opening that door, Charmain is now also looking after an extremely magical stray dog, a muddled young apprentice wizard and a box of the king's most treasured documents, as well as irritating a clan of small blue creatures. Caught up in an intense royal search, she encounters an intimidating sorceress named Sophie. And where Sophie is, can the Wizard Howl and fire demon Calcifer be far behind? House of Many Ways is now for pre-order from WHSmiths for everyone in the UK. The full description has also been released and is on its book page. Well, I have found out some *rumoured* information about the new Diana Wynne Jones book for the Castle series. Please go to the House of Many Ways page for more information. That is pretty much the update. I have noticed some of the mistakes in the simple fairytale, so I intend to work on that soon. I also hope to get up the updated version of Parallel Worlds. I'm sorry for the delay. If you really can't wait, go to FanFiction.Net. I update very quickly there. Here is the updated version of the fairytale. Uploaded a bit of jokey thing: Howl's Moving Castle turned into a simple fairytale. Done some work on the walk-through on the Howl's Moving Castle book page. Done small updates on the book page for Howl's Moving Castle and the film page. And tiny things in some places not really worth mentioning. Adding new questions to FAQ and starting on the details page on the book page. Once the Howl's Moving Castle page is done I intend to do the work on the Castle in the Air page. I will re-read the book soon. It will take a while to do all this, however, as I have a lot of college work to do. 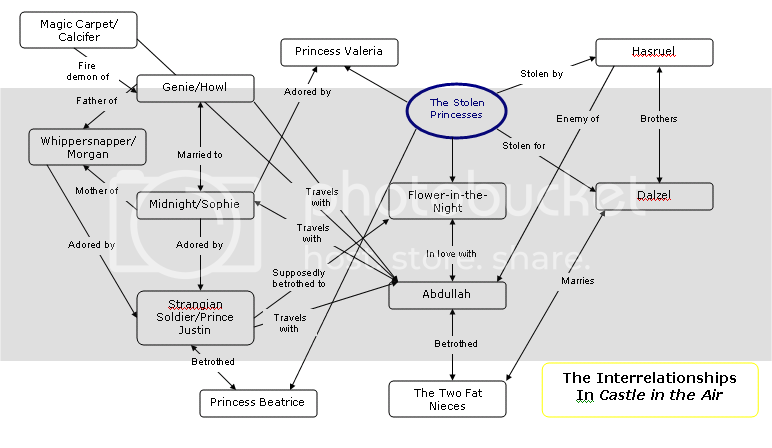 Added the interrelationships for Castle in the Air and Howl's Moving Castle: The Movie. I have some more news on the new book in the Castle series; House of Many Ways. It is good news in terms of the publication of the book for Great Britain and the Commonwealth (including Canada). Here on theBookseller.com it had been announced that HarperCollins has acquired the new book, and will be published in June 2008. It will apparently be set a few years after Castle in the Air, which was first published in 1990, in the neighbouring country of High Norland. Some many remmeber the "Elderly Princess of High Norland" lives there who gave Jermal a job there as a cook; we can assume he might appear in there somewhere. The sort of official website of Diana Wynne Jones has assured us that Howl will appear in it - we can assume that Sophie, Calcifer and Morgan will be in there too. Also the "Advanced Readers' Cover" has been released - this is the copy that will be sent to all the big important people who helped publish the book and Diana Wynne Jones herself. To see a better version of the cover have a look here on Fantastic Fiction. It looks like a young girl opening a door and seeing a load of doors and a blob on the horizon - could it be the moving castle? In Britain/Canada/Commonwealth it is coming out late May/early June (5th). In the US it's coming on 10 June 2008 - my birthday. I've finally figured out how to get rid of the spam entries in the guestbook. Very glad about that! I might not update as frequently in the next couple of weeks as I have lots of coursework to do. Thanks everyone. Due to a demand in my guestbook I have decided to post Parallel Worlds here on this website as well as my livejournal. I have re-written a lot of it because I had little spark of knowledge and was able to plan it out more effectively. I now more or less know what's happening. Hopefully you'll agree it has changed for the best. UPDATES: Tiny little edits and updates to some of the site. I have also added an oddments page for all things Castle Series. It's here. UPDATES: The new awards are up. Please don't be shy to enter because I'm very easy to please. I might do some more work on here but I have a couple of things to do. I'm back to college tomorrow and need to sort my bag out and what-not. Okay, I also did a little work in the FAQ and made a page jump. Once more you can jump straight to the relevant questions from the books pages. Please, send in your Castle in the Air questions. UPDATES: Doing a complete edit of the character page so don't go there unless you want to read about Howl or Sophie. Beginning to add some of the CitA information. Updated the graphics too. Well, first I'd like to wish everyone a happy new Year. First, I am happy to announce that apparently the new book for the Castle series of Diana Wynne Jones's books is coming out in June 2008 - hopefully in time for my birthday. Heh, I know what I'll be asking for. Rumours are it will be called House of Many Ways. Howl is apparently due to make an appearence, which we can assume means Sophie and Morgan will be appearing too. Since the Castle series is growing and I've had a couple of demands in the guestbook, I will also start putting informationa up about the entire series - Howl's Moving Castle, Castle in the Air, and House of Many Ways. ‘Howl's Moving Castle’ © 1986-2008, Diana Wynne Jones. 'Hauru no ugoku shiro' AKA 'Howl's Moving Castle' © 2004-2008 Hayao Miyazaki, Ghibli Studios. Text/Website © Sophie Withall, 2004-2008. Based upon Diana Wynne Jones' novel ‘Howl’s Moving Castle’ and Hayao Miyazaki and Studio Ghibli animated film 'Hauru no ugoku shiro'. Layout © Tripod. All characters are entirely fictional.